Mevlana Celaladdin Rumi is the founder of Sufi Tradition in Konya. We are operating tours for visitors to Konya, specially for the ones who are keen to learn more about Rumi's philosophy and history. Meet the guide and driver at the hotel at 08:30. We set off with our guide and driver westward along the ancient Silk Road toward Konya, stopping for a look at the huge Sultan Han caravansary en route. 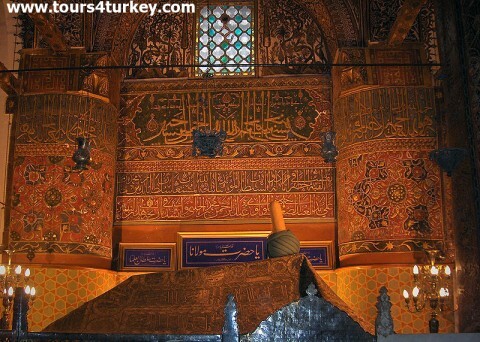 After we arrive in Konya, visit the Tomb of Rumi in the Museum of Mevlana, an important place of pilgrimage for Muslims. Then, we visit the Ottoman-era Sultan Selim mosque before having lunch in a traditional Turkish restaurant. After our lunch we drive to the Alaaddin Hill (a prehistoric tumulus) to visit the 1000-year-old Alaaddin Mosque. In its courtyard are the tombs of many of the Seljuk Turkish sultans. Walking down the north side of the Alaaddin Hill we pass the remains of the Seljuk sultan's palace, then cross the street for a view of the elaborate portal of the Ince Minareli Medrese theological college. Then we drive back to Cappadocia. Please feel free to contact us for further travel information about Konya.